As a fan of The Lord of the Rings, especially Legolas, this is a huge treat. Of course, if you're a fan, you are aware of the viral video called "They are Taking the Hobbits to Isengard", which shows Legolas saying that line multiple times, with a remixed version of The Lord of the Rings' theme song, making it funnier. Well, see for yourself. You'll be surprised! 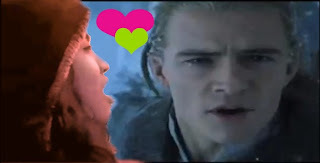 And if you're a Legolas fan, you'll probably faint. Of course, to prove that I am a Legolas fan, I will share with you a video I made in 2010. Some of you may have already seen this, but for the new readers, I hope you don't get turned off. Haha!